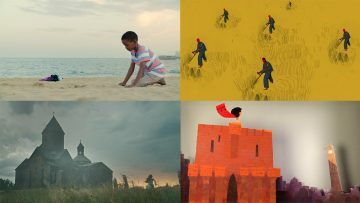 TOAFF18: D/Deaf Accessible Screenings & Events | Take One Action! Take One Action are committed to ensuring that more of our events are accessible to D/deaf audiences and those who are hard of hearing. We are delighted that, for the first time, several of our events will be captioned and feature BSL interpretation so that they can be enjoyed by the widest possible audience. When the key male members of Greece’s far-right political party Golden Dawn are imprisoned, accused of carrying out organised criminal activity, their wives, daughters and mothers step up to the task of leading the party through the forthcoming elections. 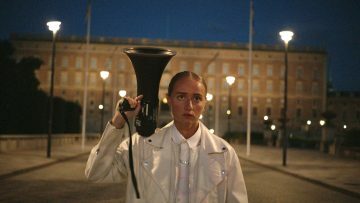 Through personal interviews that often catch his protagonists off guard, director Håvard Bustnes builds a candid portrait of a closely-guarded political family. Their conversations, evasions and confrontations offer thought-provoking insight into what fuels extremist politics in contemporary Europe. The film will have Closed Captions throughout and the intro & discussion will have BSL interpretation. Inspirational Swedish hip-hop artist Silvana Imam is the main protagonist of Silvana. Through punk-rap lyrics, Silvana explores feminism and LGBT rights among other issues, challenging society’s ideas around bodyshaming, race and gender. A thought-provoking documentary, Silvana is a moving personal account of overcoming and smashing stereotypes and the patriarchy! After each screening, Scotland-based artists including Erin Friel, Janette Ayachi, Leyla Josephine, Tawona Sithole, Nadine Aisha Jassat and Katie Ailes will perform a specially curated programme of spoken word and musical performances exploring feminism, empowerment and the idea of belonging. Christmas Island is famous for one of the largest annual land migrations – that of forty million red crabs scurrying to the sea. It also houses a high-security detention facility, in which those seeking asylum in Australia are detained indefinitely. Contrasting lush nature with enforced isolation, this stunning documentary follows trauma counsellor Poh Lin as she attempts to support detainees and explores the island’s terrain, its violent past and its inescapable present. Followed by a conversation with Usman Aslam, Glasgow-based immigration and asylum solicitor, alongside representatives from Oxfam Scotland and Scottish Detainee Visitors. Presented in association with Oxfam Scotland. The film will have closed captions throughout. No BSL interpretation will be present. Our most boutique cinema experience! Discover a carefully curated selection of short films in the unique setting of an old police box, each weekend afternoon during the festival. From food sustainability to migration, from creativity to climate justice, there’s a fantastic programme to enjoy – presented in a cosy space for 2. Each film will have closed captions throughout. 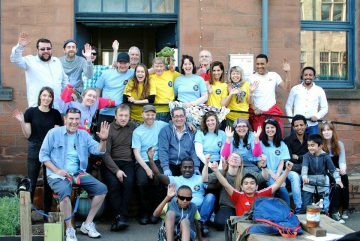 Take One Action are joining forces with Kinning Park Complex’s weekly free, activity-packed family fun day. 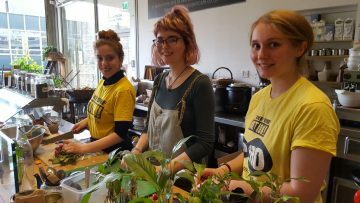 Alongside a screening of specially curated films and a special taste adventure for children, enjoy a pay-what-you-want lunch, made from scratch by the fantastic KPC volunteer team, or get your bike repaired by the bike project (donation). This is a free event for all the family and all ages, just pop by and join us – our screening will take place at 11:30am with a unique reel of short films exploring refuge, integration and family. A feast of international food and film, celebrating hospitality, connection and solidarity. Join us on the closing weekend of the festival for this inclusive community event. A specially curated programme of short films will explore the feelings, memories, anxieties and aspirations at the heart of displacement and integration, particularly as experienced by asylum seekers and refugees. It will be followed by a shared meal cooked by the Refugee Community Kitchen, served in the Drill Hall café.